Detailed Itinerary of 09 days Bali Tour is as appended below. Bali is a picturesque island of stunning jungle terrain, dramatic volcanic peaks, and elegant white sand beaches. Your flight descends into Ngurah Rai International Airport. You look out the window to find the mixture of glistening azure waters bordering coastal plains spreading to dense jungle canopy. Your private transfer greets you at the airport upon your arrival and escorts you to a fabulous hotel blending traditional Balinese architectural style with contemporary luxury. Palm trees frame the infinity pool offering a panoramic view of the Indian Ocean. Quiet restaurants flicker with graceful torches and fill the air with the aroma of grilling seafood garnished with zesty lime. The remainder of the day is yours to enjoy the pleasures of Seminyak at your preferred pace, from strolling along the boutique shops at the heart of the town to visiting the cultural landmark of Petitenget Temple on a street running parallel to the beach. The complex was erected in the 16th century with a dragon staircase leading to the vast courtyard. Dozens of shrines decorate the grounds; each draped with the traditional checkered cloths. The faint aroma of burning incense emanates from the shrines. Antique, leafy trees shade the entrance and make it feel as though you have traveled worlds away from the lapping waters of the coastline. What’s Included: dinner, airport transfer, accommodation. In the morning, the air contains hints of banana and mango. The sea laps against the white sand beaches bordering Seminyak. Shops open their doors with elegant window displays of chic contemporary styles contrasting the vintage ambiance of the neighboring villages and temples. Your guide meets you at the hotel and escorts you north to the Lakes District, located in the highlands at an altitude of nearly 5,000 feet above sea level. En route you stop in the village of Bedugul, situated at nearly 4,900 feet above sea level and offering a view of three separate lakes. The waters of Lake Bratan shimmer beneath the drifting sunlight and glow sapphire against the bordering caldera. The Botanic Gardens become iridescent with blossoming orchids and oleanders spreading across nearly 400 acres. The aroma of hyacinth fills the cool mountain air. Before visiting the iconic emerald textured slopes of the Jatiluwih rice terraces, you make your way along a trail leading east of Munduk village. The path guides you more than half a mile through the trees until you can hear an unforgettable roaring sound. A stairway leads to a viewing platform looking out onto the magnificent stream of Munduk Waterfall. The water cascades nearly 50 feet between lush foliage into the wading pool below. A gentle mist rises from the stream and cools the air. Bamboo shoots frame the beading waters flowing down the smooth rocks of the cliff. At breakfast, the rambutan adds a flash of red to the blue hues of the water and the jade shades of the treetops. After the meal, you venture into the highlands of Mount Batur to enjoy a unique tour around the shores of Lake Batur. The water shines with vibrant cobalt hues reflecting the greenery of the steep caldera walls. You follow the trails leading past villages draped in bougainvillea and blossoming frangipanis. The cool breeze touches your cheeks, carrying the herbaceous aromas of plantations, growing a mixture of celebrated teas, cinnamon, vanilla, and chocolate. The scenic drive down the mountain winds effortlessly along the roads, through the countryside, and beneath the jungle canopy. You stop at one of the plantations known for growing and producing Balinese coffee. Your guide leads you along the slopes to view the bushes and trees thriving in the tropical moisture. The berries shine with red waxy exteriors before their peak of ripeness. After berries are skinned, the farmers place them in a drying bed near the farmstead. You dig your hands into the grain to feel the texture of the coffee taking a more familiar shape and color. The farmers roast the beans to release the oils containing the rich flavor and succulent aromas that shine after brewing. You sample the coffee to find hints of caramel and cinnamon naturally infused into the beans from the mineral soil in which the plants grow. In the morning, you watch the water lap against the white sand beaches of Seminyak. You can find traces of incense drifting in the air from the shrines of Petitenget Temple blending with the sea breeze. After breakfast, you have a private transfer north to the cultural center of Bali, at Ubud. Rice paddy paddies overtake the countryside fringing the edges of town. The Royal Palace crowns the heart of Ubud connecting centuries of tradition with the contemporary culture embodied in the charming cafes. The emerald canopy of the Sacred Monkey Forest rises above the bordering streets. After settling into the comforts of your luxurious hotel offering views to the iridescent rice fields, you continue your exploration of Bali with an excursion to Mas Village. The main street contains a variety of woodworking studios in which artists display their talents for the craft, showcasing distinct methods and designs influenced by the culture. The herbaceous aroma of wood shavings and bark fills the air. You can hear the tinkering of hammers and chisels against hard and soft woods. You meet with an artist keen on introducing you to the symbols of early Balinese life. A particular baby figure represents wisdom, while another figure represents maturation. A large Garuda stands at the entrance to ward off evil spirits. After viewing the selection of the artist’s works, you make your way deeper into the studio to learn the basics of woodwork to craft a personalized statue. What’s Included: breakfast, lunch, tour, transfer, accommodation. In the morning, you can hear the herons calling out in the trees. The long-tailed macaques run along the upper branches of the Sacred Monkey Forest in large troops. They bask on open statues as if protecting the temples from intruders. After breakfast, you make your way into the hills once more, this time arriving in the small village of Pidpid, located at the base of Mount Agung. The narrow trail cuts through rice paddies, where thatched-hut homes rise out of the emerald field. Coconut palm trees soar above the pathway with fronds rustling in the gentle breeze. You begin to ascend the slopes of Mount Agung, the island’s tallest mountain reaching a height of more than 10,300 feet above sea level. The breeze brushes against your cheeks as you make your way up the foothills. The aroma of the surrounding trees contains a subtle hint of hyacinth. You stop at Pura Besakih, a temple complex in the shadows of Mount Agung with over 23 separate shrines. Elements of megalithic-stepped pyramids in the area date back more than 2,000 years. However, the Hindu elements of the complex were erected in the 13th century after the Javanese conquered the island. The temples overtake parallel ridges ascending courtyards and gateways. The main spire imitates the structure of Mount Meru, the holy mountain of Hindu mythology. Detailed stone statues adorn the bridges, stairways, and doorways of the temples, to protect the complex from evil spirits. You climb to the top of Temple Pengubengan for a panoramic view of the surrounding landscape decorated with the soaring spires and rooftops of the temples. After breakfast, your guide meets you at the hotel and leads you to Tenganan village to begin your trek through the countryside en route to Kastala. The splendors of the countryside enrapture you with emerald terraces, picturesque mountaintops, and charming thatched roofs framed by the jungle trees. Tenganan Village is renowned for its continuing production of traditional textiles known as ikat. The mixture of brick and straw structures line the main street of the village. The rare textile production consists of dying a wrap thread running the length of the cloth before weaving the cloth with singularly colored weft threads. A local woman carries on the tradition her mother taught her, weaving with a unique loom situated on the tiled floor of her home. You touch a single thread to feel its strong and waxy fibers. Palm trees shade the doorways of each home and blossoming frangipanis decorate the walkway. The colorful finished sarongs dangle on clotheslines outside the home of the weaver drying before being taken to market. You continue on the trail, passing the terraced rice paddies and bamboo bridges. A local farmer offers you a taste of palm wine, in which you find a lingering sweet flavor. You arrive in Kastala and meet a local woman eager to welcome you into her home to teach you the basic ingredients used in everyday Balinese cuisine. Prepare lunch using noodles, chilies, and spices found in the daily markets around the island, which include ginger and cardamom. The Ubud Art Market fills with local artists showcasing paintings, sculptures, and jewelry inspired by the lifestyle of Bali. Works display the remarkable terraced rice paddies and capture the power of Vishnu embodied in a stone carving. The sunlight spreads across the rice fields edging town and pierces the rainforest canopy. Your private transfer meets you at the hotel and escorts you to Sanur Beach to board the ferry crossing the Lombok Strait. The water shimmers with cobalt colors fringing the reef bodies growing out of the seafloor. You see the dorsal fins of dolphins angling above the surface water. The Lombok coastline rises along the horizon. White sand beaches sweep to craggy cliffs along the west coast. You disembark the ferry at Gili Air, the most eastward, and smallest, of the Gili Islands. The mountainous northern edges of Lombok frame the horizon. Charming restaurants and cafes line the eastern edges of Gili Air. Sandy roads crisscross the landscape beneath the emerald jungle. You settle into the comforts of your luxurious hotel wrapping around the circular blue lagoon pool. Hyacinths blossom against the crystal clear water, and the lavish cabins overlook the edges of the indigo sea. The remainder of the day is yours to discover the pleasures of Gili Air whether by foot, bike, or kayak. For a special introduction to the island, you can take to the water in a glass-bottomed kayak. The unique flotilla allows you to see into the crystalline waters below, passing above colorful fish and vibrant, shallow coral. The morning breeze of Gili Air fills with the scents of coconut and seawater. The beachside cafes open their doors to the drifting aroma of freshly brewed coffee. At breakfast, you find the creamy textures of custard apple and jackfruit accompanying a delicious cappuccino. The day is yours to enjoy the splendors of Gili Air and the neighboring Gili Islands at your leisure, taking to the Gili Meno to visit the marvelous Turtle Sanctuary or taking to the water with a snorkel and fins to view the fringing coral reefs. The sand is powdery on your skin, clinging to your feet and ankles. The water is warm and refreshing beneath the tropical sun. A local canoe takes you to a spectacular snorkel spot where the coral rises from the seafloor at a depth of nearly 50 feet below. Hard coral resembles rugged mounds and hills, adorned with tabletop and staghorns. The sunlight spreads across the waters allowing for visibility up to 20 feet. You move with the current, watching the sea grass wave like trees in the breeze. The grass moves upwards towards the surface, and you realize you are watching a sea turtle grazing. The loggerhead can grow to 35 inches long and weigh up to 1,000 pounds. Their shells contain large plates decorating the top with yellow and orange hues resembling the colors of the coral. In the morning, you can hear the sea birds chirping over the shoreline in search of breakfast. The quiet cafes open their doors and fill the air with the drifting aroma of coffee. People take to the bike paths to explore the shores. Fishermen cast their nets from the comfort of their traditional boats. They return to shore and balance their nets on bamboo posts resting on their shoulders. A jeweler on the beach offers pearl earrings glinting in the sunlight. After breakfast, you board the ferry bound for the shores of Lombok. You arrive on the northwest shores of the neighboring island to meet your private transfer escorting you from the beach to Lombok International Airport where you board your flight home. 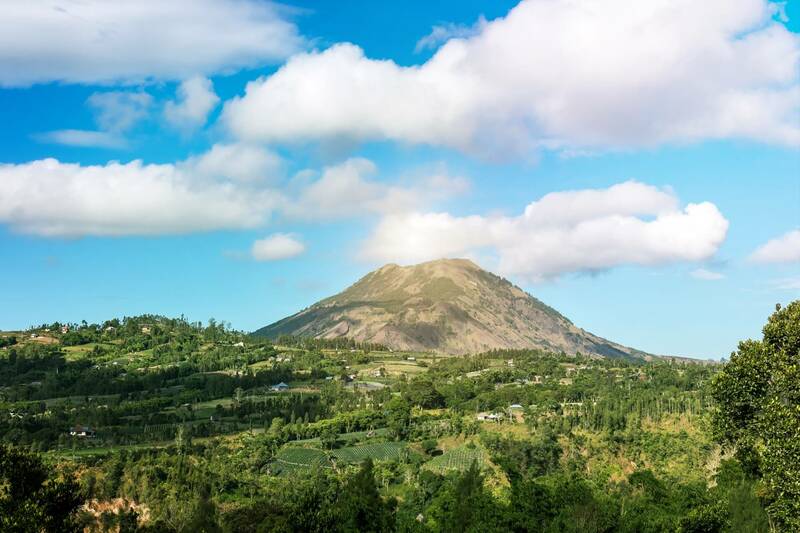 Follow the trails circling the shores of Lake Batur inside the incredible Mount Batur caldera. Visit a plantation to learn the process of cultivating coffee in the tropical terrain before enjoying a tasting.